Saturday, January 14, 2017 9:00 a.m. – 3:30 p.m.
Rueben Contreras will also continue his regular drawing classes in January. Contact the artist directly for these: Email contreras11121@att.net Phone 682-241-0053 . Mail checks to Ruben Contreras, 5307 Maverick Dr Grand Prairie Tx 75052. Ruben Contreras was born in Guatemala, the oldest of fourteen brothers and sisters. At an early age he began to develop his artistic talent. He now live in Grand Prairie, Texas, with his wife and children. The subject of much of his art reveals his passion for nature. His paintings are done primarily in acrylic, and he exhibits great skill in capturing realistic images and emotional content. Reuben is a member of the Arlington Visual Arts Association and the Irving Art Association. 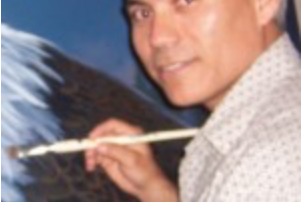 He regularly teaches painting to private students. He actively exhibits his work and has won awards in juried art competitions in Arlington, DeSoto, Midlothian and Granbury.